You've all wondered who would be next. Here he is. 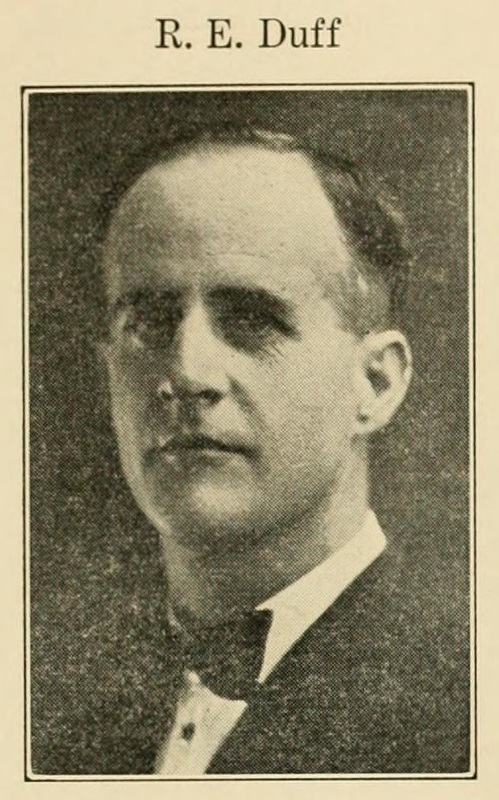 Robert Earl Duff, son of Mr. and Mrs. J. N. Duff. Mr. Duff, now deceased, was a pioneer business man of Clay City. The subject of this sketch was born October 5, 1886, on East Second street, where his mother now resides. Earl is a comparatively young man and has no lengthy biography but he has been active since completing his education in the Clay City schools. After several years of clerkship in the stores of Clay City, in 1923 he formed a partnership with John D. Bones, now deceased, in the real estate business. He was also elected in that year as secretary of the Clay City Building, Loan & Homestead Association. He also was elected at this time as supervisor of Clay City township and was re-elected supervisor in 1925, serving two terms with the credit of furnishing the tax payers of Clay county with the long form tax receipts and moneys being paid into the treasury that had been forgotten or misplaced by some of the county officials. He was chairman of the board in his last term. He refused a place on the ticket in 1929 which meant his election again to this office. In 1926 Mr. Duff and W. H. Banker purchased a grocery store, located in the south room of the I. O. O. F. building, from J. E. Brissenden. In March, 1929, Mr. Duff sold his interest to Henry Weiler. Since that time Mr. Duff has maintained an office at the store where he handles the business of the Building & Loan, his real estate and insurance. Earl is now serving not his first term as one of the village councilmen. He is active and ready at all times to do his part in any civic affair that comes up. He has a family, three children all in school, owns his home and is president of the Clay City Booster Club. Earl is well liked and quite congenial among his fellow citizens, and our little booklet, which we will issue within a few months and which will be preserved by hundreds of our readers, will not be able to mention all the good that there is in Robert because there is a lot that is to come and cannot be predicted at this time.